Elizabeth’s love affair with crystals started relatively recently (January 2009), but when she first awoke to the beauty and power of crystal energy, she fell hard and fast in love!! Where to start about how wonderful and useful crystals are? Over time, Elizabeth has come to realize that crystals are divine beings, and like other beings of Light, are dedicated to helping humans with their loving support, and do all they can to help us to be happy. The energy coming off most crystals, if you are awake to energy, is simply amazing, but some crystals are more powerful than others, and for some crystals their energy is weakened or warped in some way because they have mopped up negativity (in service to the humans around them) but have not had that bad energy cleared out. I am constantly in awe of the gift of pure love and intense energy that our crystal friends provide us with constantly. Some people are into angels for their protective and loving nature; that’s how I feel about crystals. From this page, you can navigate to others that have interesting information about crystals and how they work. Are you interested in a basic introduction to how crystal healing works? Or are you wondering what the properties of certain crystals are? Elizabeth is also attuned to giving ethereal crystals. You can get an unlimited number of placements with a paid consultation. They work! Plus, you can put ethereal crystals in places where regular gemstones can’t go (a chakra, and organ, your aura) and the can never roll off. They also stay put until you no longer need them, and then they simply disappear. If you’re interested in going further with Crystal energy, Elizabeth highly recommends starting with her Earth Magick Essentials guide. 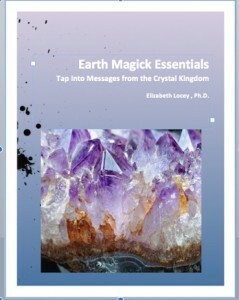 This ebook succinctly delivers essential information about Elizabeth’s favorite crystals, arranged in easy-to-digest table format. Purchasing the guide automatically enrolls you in her occasional Crystal-Pulling Parties where your guide will come in extra-handy! After you’ve tasted to uncanny ability of the stones from Elizabeth’s bowl to discern your deepest emotional-support needs and offer it up to you gracefully in her Crystal-Pulling Parties, you might like to check out her signature program, CrystalCRUSH. CrystalCRUSH is the first level of a 3-level certification program, and has evolved into Elizabeth’s most popular group program. Yes, it’s super fun, but PACKED to the gills with tons of information about the metaphysical properties of 2 dozen of Elizabeth’s favorite stones! Whether worn as jewelry, or carried in a pocket or pouch, crystals offer unlimited support and Love. All you have to do is accept it! Always remember: using crystals is not self-indulgent, it’s therapeutic! You deserve to be the healthiest, most loving, expansive, and evolved person that you can be in this lifetime!